Earlier this month at the Bologna Motor Show Alfa Romeo CEO Antonio Baravalle announced to the media that the new Alfa 8C Competizione would be hitting the world's biggest 24 hour races at Le Mans, the Nürburgring and Daytona, as well as spearheading an "important" US programme, sparking intense speculation about the ambitious new project. The Alfa 8C Competizione will be homologated in the FIA GT2 class (although the detailed regulations do change between each of the races) where it will tackle proven winners from Porsche and Ferrari. Turning the Alfa 8C Competizione into a track victor will be a huge project to achieve, and to succeed in this aim, several experienced major partners are expected to be brought into the project, including tyre giant, Pirelli, and leading Italian race car chassis constructor, Dallara. While it is reported that Dallara will build the cars, the race project will be based at the Maserati factory in Modena where the existing Maserati Corse team will turn its attention to the 8C Competizione once the on-going MC12 activities are wrapped up at the end of next year. Along with the Maserati Corse team structure and technicians will come Pirelli, the tyre manufacturer which is also a partner in the current factory MC12 programme, and their official test driver Fabio Babini is expected to be one of the initial drivers to get behind the wheel of the new 8C Competizione when it hits the tracks in just under a year's time. Along with Babini will be official Ferrari and Maserati test driver Andrea Bertolini who won this year's FIA GT Drivers' Championship title at the wheel of a Vitaphone Racing Maserati MC12. Information suggests that the Alfa 8C Competizione racers will be developed and built by Dallara, one of the world's most successful race car manufacturers, particularly in the arena of single seater racing. In 1978, Gianpaolo Dallara, who was famous for being part of the team that realised the iconic Lamborghini Miura, designed his first Formula 3 car, which won the Italian F3Cchampionship the same year. In 1993 Dallara introduced an all conquering new car which led to the company becoming the F3 market leader. Today F3 is a corner stone product of the Dallara company and has been a great success story with their cars having won championships worldwide, including in Italy, France, the United Kingdom, Germany, Switzerland, Japan, South America, Russia and Austria. From 1988 to 1992, Dallara Automobili designed and manufactured F1 cars for Scuderia Italia. On the race tracks the Alfa 8C Competizione will tackle proven winners from Porsche and Ferrari. 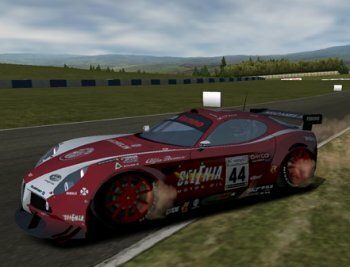 Photo: The Alfa 8C Competizione has already made an appearance in 'race' format in the popular computer game SCAR (Squadra Corse Alfa Romeo). Earlier this month in Bologna Alfa Romeo CEO Antonio Baravalle announced to the media that the new Alfa 8C Competizione would be hitting the world's biggest 24 hour races at Le Mans, the Nürburgring and Daytona. 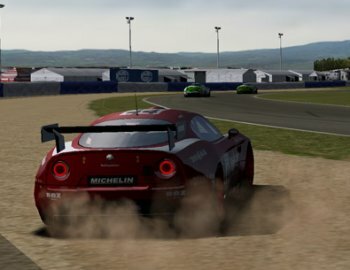 Photo: The Alfa 8C Competizione has already made an appearance in 'race' format in the popular computer game SCAR (Squadra Corse Alfa Romeo). Since 1997, Dallara has designed and built chassis' for teams competing in the Indy Racing League championship. Dallara cars have won the series championship seven times since 1998 and the Indianapolis 500 race six times since 1998. Dallara has also won the IRL manufacturers championship eight times since 1998. This year Dallara chassis won thirteen of the fourteen IRL races, the Italian constructer amassing 137 points to its rival Panoz' 45 points; while Sam Hornish wrapped up the drivers' title at the wheel of a Penske-run Dallara-Honda. This stateside experience can only be of benefit to the 8C Competizione race programme which will also spearhead the brand's US re-launch. Dallara has also built up a close working relationship with some of the most prestigious motor car manufacturers, including Lancia, Alfa Romeo, Audi, Toyota and Honda, where it has consulted in the areas of design, research and production of racing projects. In April 1998, Honda gave Dallara the responsibility of design, aerodynamic development and manufacturing of Honda F1 chassis. In April 2000, Dallara signed an exclusive agreement with the French team ORECA for the supply of sports cars, powered by Chrysler engines, that compete in the 24 Hours of Le Mans. In 2001 Dallara was awarded two prestigious 'one make' contracts, one for the Spanish Formula Nissan (Now the World Series by Renault) and the other the US Infiniti Pro Series, both launched successfully in 2002. More recently Dallara was awarded the contract for the supply of all the cars to the Gp2 series-an innovative new car that is the true stepping stone to F1. The series is the official FIA support to the Formula One Grand Prix in Europe. Dallara say their facilities are 'state of the art' and include two wind tunnels, a seven post Dynamic Test Rig, CAD, FEA, CFD design facilities, a composites department and a modern well-equipped machine shop. In short, say the firm, they are facilities that would rival most top Formula One teams, and an ideal basis for the Alfa 8C Competizione racing project.